Palestinians Wonder: Who Will Be Our Next Leader? : Parallels Palestinian Authority President Mahmoud Abbas is 81, a heavy smoker and has a history of health problems. He was elected more than a decade ago, and it's not clear how he would be replaced. Palestinian President Mahmoud Abbas speaks in the West Bank town of Bethlehem on Oct. 1. Several days later, Abbas, 81, underwent an urgent cardiac test, but was soon released. 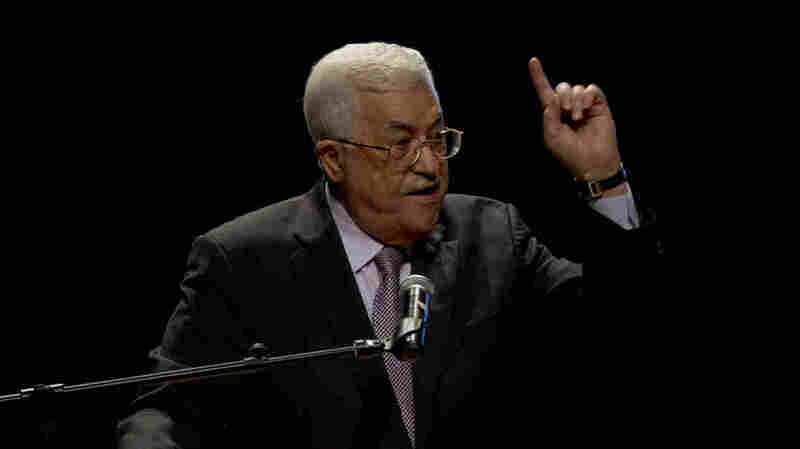 The health scare has increased talk about a possible successor as the Palestinian leader. Palestinian Authority President Mahmoud Abbas was rushed to a hospital last week, underwent urgent cardiac testing and walked out of the hospital hours later — smiling to TV cameras. "I feel fine," Abbas, 81, said as he left the hospital with an entourage of officials. But not everyone was at ease. Abbas has a history of health problems. He's a heavy smoker. Palestinians realize his days in office may be numbered. "We're talking months. Not years," said Nasser al-Laham, editor-in-chief of Maan, a Palestinian news agency. He spoke while puffing on a thin cigarette in his Bethlehem office, decorated with framed photos of him posing with Abbas. So, who would follow Abbas? There is no clear answer, because the state of Palestinian leadership is in disarray. Following the November 2004 death of Palestinian Liberation Organization leader Yasser Arafat, his longtime No. 2, Abbas, was elected president in January 2005. But Abbas' term was only for four years. His rival, the Islamist group Hamas, won parliamentary elections in 2006 and wrested control of the Gaza Strip in 2007. Ever since, Hamas has ruled Gaza, leaving Abbas and his Fatah party to rule only the West Bank. These two main Palestinian factions continue with their bitter dispute, and no elections have taken place. Meanwhile, Abbas has been reluctant to appoint a successor. "Mr. Abbas understands, and I think rightly so, that once someone is appointed as a deputy president or designated as heir apparent, then he loses most of his authority and becomes a lame duck," said Ehud Yaari, Middle East commentator for Israel's Channel 2 TV and a fellow at the Washington Institute for Near East Policy. "He's very afraid of this." Laham is confident the transition of power will be smooth, but others are nervous. "There will be some chaos here," said Imad Jafar, 34, who manages a sweet shop in Ramallah. "Who will get in his place? There are many people who are fighting for this." Plan A: According to Palestinian law, if a leader is incapacitated, the speaker of the parliament assumes the role of president for 60 days, before elections are held. But the parliament is "broken," as Laham, the Palestinian news editor, put it. It has not met for nine years. The speaker, Aziz Dweik, is a member of Hamas who lives in the West Bank. It's highly unlikely that Fatah would dare give the presidency to its main rival, even if it's temporary. On top of all of this, national elections for president may not happen: The Palestinian leadership might be unable or unwilling to hold them. Plan B: The temporary leadership role would go to the head of the Palestinian National Council, which acts as the parliament representing all Palestinians both inside the Palestinian territories and in the Palestinian diaspora, Laham says. After 60 days, the council would elect the next leader. But in the past, the Palestinian National Council has faced difficulty convening. Plan C: Temporary leadership goes to Abbas' deputy in the Palestine Liberation Organization, the veteran Palestinian official and peace negotiator Saeb Erekat, said Laham. Then the executive committee of the Palestinian Liberation Organization holds internal elections to select the new leader. Without an heir apparent to Abbas, there are many senior Palestinian figures who would likely vie for the role of president. But within Fatah, there is so much rivalry and mistrust between senior officials, it is unclear who could be a unifying force and assume a natural leadership role. For example, Mohammed Dahlan, the former security chief in Gaza, had a falling out with Abbas in 2010 and was exiled to Dubai. He has been pouring money into Gaza to build political support, growing close to the leaders of Egypt and the United Arab Emirates, and is said to be waiting for Abbas' exit to return to the West Bank. But he's a major rival of Jibril Rajoub, the former West Bank security chief who now heads the Palestinian Football Federation and is a senior figure in Fatah. Their rivalry could keep both men from becoming president. One man who has long been seen as a possible successor to Abbas is Marwan Barghouti, a leader in the first and second Palestinian intifadas, or uprisings, against Israel. "I personally believe that Marwan Barghouti will be the president," Laham said. But there's one major snag: He is serving multiple life terms in an Israeli prison, convicted of involvement in deadly attacks on Israelis. Laham sees it as an advantage. He believes it would embarrass Israel. "I wish that all over the world, that they know our president is a prisoner. With a T-shirt, with 'Shabas' [the Hebrew acronym for the Israel Prison Service], in the Israeli prison. I like that," Laham said. Yaari of Israeli Channel 2 TV has reported, based on anonymous sources, that the crown prince of the United Arab Emirates has sent emissaries to discuss with Abbas his own pick for the next Palestinian leader: Nasser al-Kidwa, the nephew of Yasser Arafat and former Palestinian foreign minister and ambassador to the United Nations. The so-called Arab Quartet — Egypt, Jordan, Saudi Arabia and the United Arab Emirates — favor Kidwa, according to Yaari. Laham said this was a "myth," but called Kidwa a "normal" candidate. "I don't think the Israelis are going to be very happy with Mr. Nasser al-Kidwa," Yaari said. "He's been very, very venomous toward Israel when he served at the U.N. or as Palestinian foreign minister." A recent Palestinian poll did not do much to clarify the situation. The poll, by the Jerusalem Media and Communication Center, suggests no single Palestinian political figure has a majority of support of Palestinian youth. Of 1,000 Palestinian youth surveyed in the West Bank and Gaza Strip, about 13 percent said they would vote for Marwan Barghouti, and around 9 percent said they'd vote for Mohammed Dahlan. About 10 percent said they'd vote for Hamas leader Ismail Haniyeh, who is in Gaza. Israel's interests, Yaari said, are to have a Palestinian president who will maintain stability in the West Bank, continue cooperating with Israel on matters of security, and, if possible, work with Israel to improve conditions for Palestinians in the West Bank in the absence of formal peace negotiations. But what are Palestinians' interests? It will be difficult to find a new leader who can represent the majority of Palestinians, because Palestinian society is so divided about its vision for the future. "Some people want to make war" with Israel, said Ashraf Zaoul, 32, a television cameraman, off-duty and speaking on a busy downtown street in Ramallah. Others, he said, "want to live ... want to work." He mentioned the large number of Palestinians who work in Israel and earn a good income. "I think there will be a crisis when Abu Mazen leaves," he said, referring to Abbas using the name by which he is widely known. "We are in a situation of a state of divide."